I believe that santero art speaks for itself … and speaks to each viewer in a different way. One person may appreciate its artistic qualities, another may respond to an object of devotion. Today, I carry on the tradition and faith of a family where saints were very much a part of our lives. As a young girl I was surrounded with home altars and shrines devoted to the santos that protected and cared for the family. I call myself a santera, and I create the devotional pieces that will be treasured, blessed and appreciated by its owner. I am expressing myself by acknowledging my culture and preserving an art form for future generations to carry on. 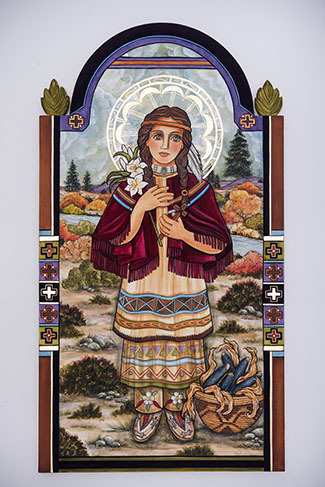 Arlene creates contemporary retablos in traditional form to express pride in her heritage. Sena's works make innovative use of natural pigments, while her soft, graceful lines and delicately applied gold leaf renders familiar imagery in an immediately recognizable, personal style. Sena’s work has achieved national and international acclaim. In addition to countless private collections, her santos have been acquired by the Museum of Spanish Colonial Art, The Museum of International Folk Art, Taylor Museum, Regis University and the Vatican. A recipient of the Governor’s Award for Excellence in 2010, the Archbishop of Santa Fe's Award in 2001, and the Spanish Colonial Arts Society’s Master’s Award in 2012, Sena has recently completed a number of prestigious large-scale commissions, including an altar screen inside Santa Fe's St. Francis Cathedral Basilica, Our Lady of Guadalupe, and for the Bishop of Gallup’s private chapel. In 2018, Sena was also featured on PBS !Colores!